Well, after much waiting and a bucket load of patience, things have got underway this week with our planned Construction work. Ahead of the building work commencing, where we are turning part of the barn into a farmshop/Cafe, we needed to clear many trees and shrubs. It’s a shame that we had to lose so many, but we will be replacing those we have lost. Unfortunately that included the magnolia, which we had hoped we could keep, but even if it had been cut back, it would’ve blocked much of the light which we hope will come streaming through all the glass at the front of the new build. It has been good watching the professionals at work this week, people who have obviously been doing there jobs for many years and use their experience to simplify the work. Normally, I would have got in a couple of large skips to get rid of the bulk of all the trees and shrubs and then with the help of my trusty quad and trailer would burn the rest up the green mile. Not on your nelly! We torched the lot, right where we had dug them up. In a matter of hours, the place was bare and all that was left was level, bare soil, easy I thought, why didn’t I think of that! The other work ahead of building commencing, was to get the new entrance cut through the hedge, the new road put down and and the two entrances kerbed and tarmaced. (Did you know that hot tarmac sounds like Rice Krispies as it cools down?) I have been amazed at how much can be done in such a short time with the right tools and it helps if some of those tools include enormous diggers and dumpers. Whilst having the professionals on site I took the opportunity to have a couple of things shifted which would have taken me literally months to move. My enormous compost heap, posts included, was moved and buried, leaving no trace of where it once stood, much to the disgust of the rat family who ran about frantically seeking a new hole to disappear down. Sorry, rats, you’ll get no welcome around here! After, having the countless nettles sprayed some weeks ago, it was time to start with the strimming to clear them out. It’s a shame that when I decided to start my jobs for that day I didn’t consult with the hens. You see, it was definitely not in the plans of some of my hens that I was going to be coming along with this extremely loud, very sharp, spinny thing, to disturb their peace, whilst they were laying. 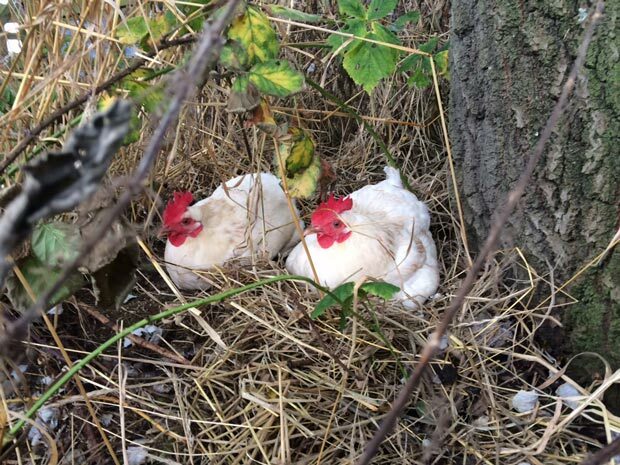 The thing is, some of our wandering hens have been laying their eggs in the middle of one patch of nettles, neatly sheltered under some trees, idyllic in fact. Then, along comes this noisy beggar to move them on. Well, they had other ideas and as I started strimming, I thought they would up and leave the neighbourhood in search of a more peaceful place to park their parsons nose! Not a chance, even when I got up close and personal with my brush cutter, they didn’t even flinch. It was a battle of wills and I’m afraid living with a houseful of women has taught me to back down quietly and walk away, so I did and came back to complete their nesting area later! Anyway, got to fly, that pesky ‘wabbit’ is back and I can see in his eyes, he is thinking about digging up my lawn!